I was so delighted when Courtney Brandt mailed me again about her brand-new book. I am always happy to help promote books, especially if they sound and look fabulous. 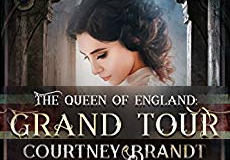 So, a warm welcome to the spotlight post for Courtney Brandt’s newest book: The Queen of England: Grand Tour. This is the second book in The Queen of England series. 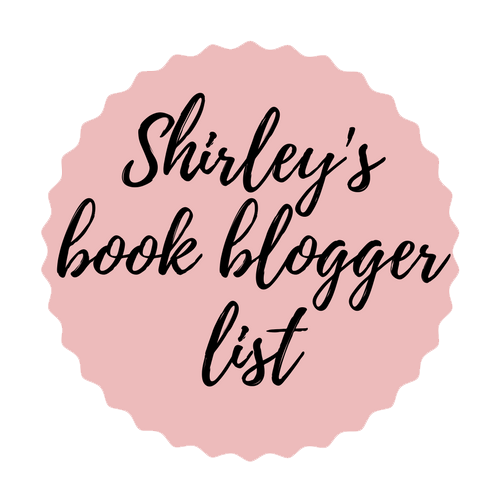 You may remember that I also spotlighted her first book. Just like with that one, I am happy to tell my readers that the author has given me the chance to give one copy (ebook/kindle) of her newest book to one of my readers. You can check out the giveaway in the bottom of this post, it is open internationally and it will run for one week (so plenty of time to enter). I also got an excerpt, it features the first chapter! Time to start! Let the Grand Tour begin. Edit: The giveaway is now over, and the winner of the giveaway issssssss: Stephanie Z! Congrats! I will be contacting you, and then send your mail address to Courtney so she can give you an ecopy of her book. Queen Juliette returns in the second novel of this exciting steampunk trilogy to take her fight to the Continent. Aided by handsome Captain Jonathan Cranleigh and the legendary sword Excalibur — uncovered in the first book — Juliette strikes out in search of the New World Order (and to perhaps find an appropriate fiancé during the journey). The young Queen of England departs familiar shores with an unusual coterie aboard the HMAS Little Majesty. With unplanned stops, multiple airship battles, and other unexpected challenges, this overseas trip is anything but uncomplicated for the young monarch. An exciting conclusion in London and other revelations bring significant changes in the sequel to The Queen of England: Coronation. Ms. Brandt is proud to present The Line, and the additional novels in the complete series, A Fine Line, Keeping in Line, and The Line Up (available individually, or as a complete Anthology). 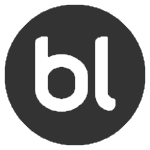 Each of the lighthearted novels was created for high school students and alumni in marching band. Ms. Brandt was proud to announce the release of Confessions of A Teenage Band Geek in Fall 2011 and her final YA marching novel, Major Pain, in the fall of 2012. 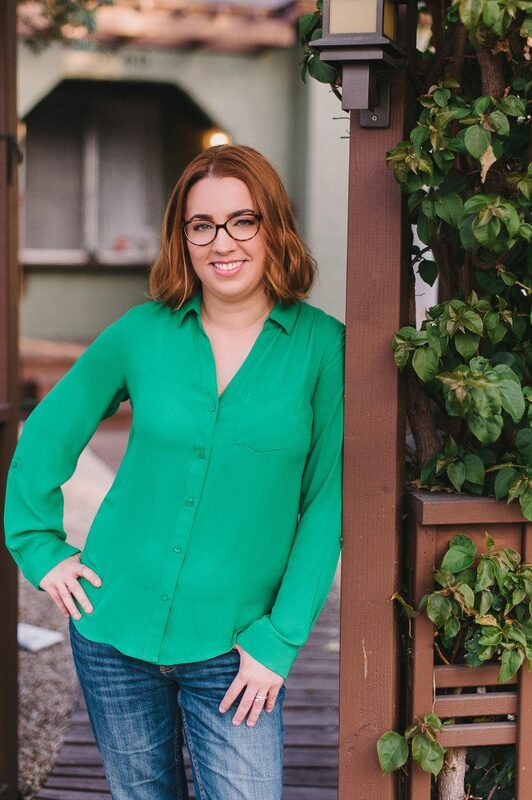 As a former drumline member, Courtney enjoys bringing a fictional voice to band geeks all over the world. Courtney is now looking forward to turning back to her YA roots as she completes a new steampunk series set in an alternate Victorian England. 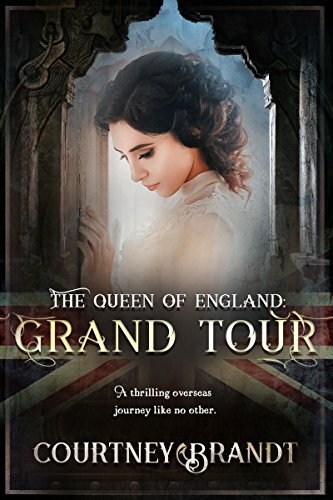 The Queen of England: Coronation, The Queen of England: Grand Tour and The Queen of England: Ascension are a planned trilogy, with the first book in the series now available. Additionally, Ms. Brandt would like to invite you to check out her two contemporary adult novels, Room 702 and Life After Joe, published under her pen name, Ann Benjamin. Find her here: Excerpt time. As the relatively new Queen of England, in the months following my chaotic coronation and the subsequent rebuilding of London, a resolute calm had taken over myself and my country. Britons appeared extra cautious, but a feeling of ‘keep calm and carry on’ seemed to be the byword on the streets of the capital. We would not stand down. We would not live our lives in fear. While the Empress, the leader of the New World Order, a radical group behind an attack which had killed off much of our senior leaders in the previous year (her majesty Queen Victoria among them), remained frustratingly beyond our reach, my close companions and I did all we could to ensure the organization was causing no further problems on British soil. However, protecting England was no longer enough for me. “Queen Juliette, I know we’ve discussed this on previous occasions, but you cannot simply up and leave London…” Askew said. Today he sported one of his rather dashing silk eye patches, this one in a shade of vermillion. His right eye had been damaged on the day of my original coronation, and he still limped slightly. Silk usually meant he was trying to impress someone—I wondered who. “People will think you are abandoning them,” Captain Jonathan Cranleigh said, ever the voice of reason. As Captain of the Queen’s Guard, and a recently endowed member of the Order of the Garter, he was the most complicated man in my life. We had shared a few kisses, but he had most annoyingly kept his distance in the recent past. Needing to put my country back together, trying to figure out how to wield the legendary sword Excalibur, and act as much as a Queen as everyone expected, I did not have much time to care about the matter. Of course, much to my chagrin, my bothersome emotions seemed to surface now and then. Cranleigh’s handsome visage refused to leave my dreams and I did still see a raise in my heartrate in his presence. Furthermore, I had an excellent correspondence with two other masculine persons, the Prince of New Catalan, his Serene Highness Estevan (never mind I had been involved in the death of his brother, a fact I had yet to disclose to him) and a secret admirer, whom I had nicknamed Lord Handsome. While all of England wanted to see me happily wed, I was in no rush to take a husband. “I still don’t understand why this person won’t come to us,” Cranleigh grumbled. “‘We’ are not all the monarch of a country, your majesty,” Jonathan said, a gloved hand on his mustache. Drat. This particular idiosyncrasy usually signaled his irritation with something I had done or said. It was rather a constant affliction in my presence. The ancient sword remained a bit of a mystery. The powers I had previously summoned were inexplicably muted, leaving myself and Briscoe, a member of the ancient Company of Merlin, utterly confounded. For whatever unknown threats that we would face, I had not made enough progress. My inability to increase my magical skills was another failure in a long line of bad decisions. In our showdown with some of the operatives of the New World Order, there had been evidence of a golem. This half man, half creature who still haunted my dreams, was apparently the prototype for an army the organization was putting together. The group, who were fixated on alchemy, believed Excalibur had the ability to bestow sentient thought to these beasts. Therefore, it was more imperative than ever that I master all elements of the weapon. Although the argument could be made that the sword was safer within our borders, as of now, I was the only person who could wield Excalibur and thus did not fear it falling into enemy hands. While there were those who wished I would put the sword in storage, my constant wearing of Excalibur had started a bit of a weapons craze among the young ladies in London. Women of all ages in my court started carrying swords, daggers or rapiers for nearly every day of the week. Many were embellished with all sorts of frippery, but they were also functioning weapons. Although plans for a Grand Tour had been part of an ongoing discussion, given my rather disastrous coronation ceremony, I had believed the monarchs of Europe wanted nothing to do with me. However, given my unattached marital status combined with the resources of my realm, the details surrounding my confirmation of the British throne could apparently be overlooked. Ever since I had officially been crowned Queen Juliette I (in a private, non-interrupted ceremony some months ago), invitations of visitation had come pouring in from nearly every kingdom and hamlet of Europe. The lone exception was tiny Lichtenplatz, who were still refusing to recognize my sovereign claim to the English throne. And of course, I retained a majority stake in the Malay Maritime Company, my deceased father’s legacy. Of course, I was not completely on my own. One of the members of a European royal household had given me special attention over the past months. Much to my delight, I received increasingly personal missives from Prince Estevan, who was currently on an extended visit in London. The Prince was a charming and handsome distraction from the stresses of my royal duties. On more than one occasion Estevan (we had long ago dropped the fancy titles between us), had invited me to visit his castle in New Catalan (not that I wasn’t without my own estates, but I did hear wonderful things about the Mediterranean), but I had not yet accepted. The Prince had done so under the pretense of breeding my lovely Britannia (the unicorn he had gifted me with as a coronation gift), but I thought his invitation was a not so elaborate ruse to meet his mother, the reigning Queen Furaha. And yet, how could I visit his country when I couldn’t bring myself to share the details regarding the death of his brother, Prince Tamba? Although I had indirectly been at fault, I was terrified at how Estevan would react when he heard the truth. Excalibur was now constantly chiding me for being selfish, but I couldn’t bear another person leaving me. “God save the Queen,” Cranleigh muttered. “Ladies will not be able to vote,” Jonathan said from across my desk. In response, Cranleigh grumbled something to the affirmative. “Where does one meet the High Wizard exactly?” Askew asked. “Then we must take the opportunity to seek out your Grandmother.” Askew clapped his hands together. Askew sent me another meaningful glance. He was the only other person who knew of the existence of my half-sister. While we’d not been successful in our attempts to locate her thus far, I did have a secret contingency trying to determine her location. She would, of course, not be able to step in for me at any such traditional occasions, but I did so want to make her acquaintance. While certainly, it would be a shock to have the Queen of England as your half-sister, perhaps Papa had told her he had another daughter. I had dreams of introducing her to society and sponsoring her coming out. Of course, she was proving difficult to track down, to the point it was almost as if she did not want to be found. The door to the room suddenly opened and Quick, my streetwise page, rushed to my side. With no sense of propriety, he thrust a note into my hand. Excalibur glowed brightly for a moment, then dimmed, alerting me to the fact all was well to proceed. Without hesitation, I opened the letter and began reading. The handwriting, of which I had previously studied quite thoroughly, immediately leaped out to me. There was no mistaking the person who had threatened me before my coronation. The Empress. “What do they want?” Cranleigh asked, clearly reacting to the look on my face. Waiting On Wednesday ~ Scream and Scream Again!